The Garden-based School Programme offers hands-on, interactive, curriculum-linked learning programmes to learners from Grade R to 12. Learners can have fun learning in a beautiful natural environment. The Garden is situated in the Kogelberg Biosphere and extends from the mountain, with the Disa and Leopards Kloofs, to the sea thus creating opportunities for a wide range of lessons including a marine ecology lesson. Special lessons are facilitated in celebration of the Environmental Days and Weeks. Lessons are offered in English, Afrikaans and isiXhosa. Decide well in advance when a lesson in the Garden is going to be most beneficial to your learners. Contact Eunice Jurgens to book your lesson. A booking form will be sent to you via fax or email. Complete and return the booking form, making sure to indicate your choice of lesson. Please ensure that there is at least one educator or adult available to supervise every 20-25 learners. One educator or adult per 25 learners participates free of charge; accompanying educators and adults are expected to be with the group for the duration of the lesson. Learners will need to eat a snack before entering the Garden for the lesson and have their lunch after the lesson because of the baboons which may be present in the Garden. Lessons in the Garden on environmental themes are also offered to youth and adult groups from community and environmental interest groups, tertiary education institutions and partner institutions. We also do off-site programmes, for example, with special needs schools who cannot visit the Garden. Times may vary according to the requirements of the group. Usually 3 hours duration. 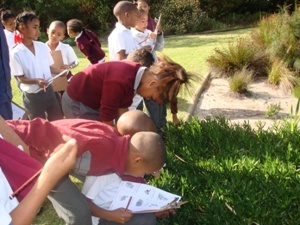 Learners observe at the diversity in our nation and the diversity of different species of animals and plants. They then get to see how diverse fynbos plants are. A large part of the Garden is not cultivated, making a biodiversity lesson a journey of discovery. Our cultivated garden has a number of areas where different ecosystems are represented. This is ideal for our biomes lessons as learners can move from the forest area to the coastal dune, to the wetland area and into the fynbos garden to conduct investigations. Each biome has its own special type of plant and animal life. Learners consider the pressures and threats to each biome. The indigenous forest offers learners an opportunity to discover the living creatures that live on the ground floor, understorey and canopy of our forest. They are also introduced to beautiful trees and are taught about their importance to human survival. They learn concepts such as habitat, food webs and ecosystems. The younger learners can listen to the different sounds in the Garden, and also smell, touch and see the beautiful flora. They can listen to the birds and smell our lemon-scented pelargoniums. They have fun learning through play. Learners discover how plants adapt to their environment in order to survive. They then make the link to human adaptation. We also focus on Fynbos adaptations. In the Khoisan garden, learners can correlate the use of medicinal plants in history to their usefulness today. They learn about the medicinal, ecological, aesthetic and economic importance of South African plants. They make the association between everyday household goods with the plants found in the Khoisan Garden. The marine lesson is an adventure on the rocks. There are lots of discoveries to be made by curious learners in these beautiful surroundings. They investigate sandy and rocky shores. They can find sea lice and ghost crabs in the sand, limpets on the rocks and octopuses in the rock pools. Learners can touch live abalone, starfish, chitins and anemones. The impact of poaching on marine life is discussed. The following environmental calendar days and weeks are celebrated with special programmes: Wetlands Week, Water Week, Biodiversity Week, Environmental Week, Arbor Week, Marine Week and Heritage Week.